020161022 Filed under books, films, installations, umwelt, work. Bookmark the permalink. cover of the 1967 edition. 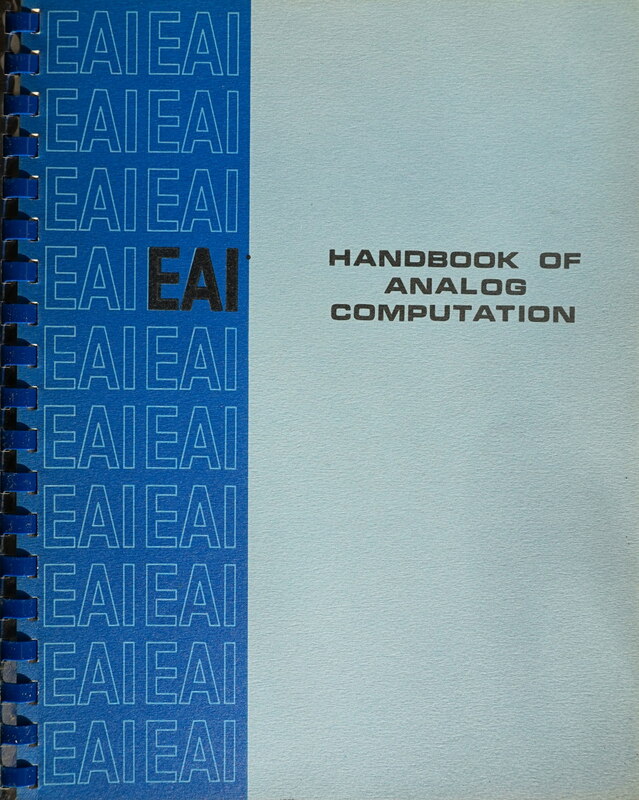 Since I wrote my somewhat longish post on analog computing, many things have happened. For instance, I have become the proud owner of an EAI TR-48 analog computer from 1963, a machine to which I will devote a future longish post with plenty images as soon as I have finished restoring it. Another thing that happened is that I stopped buying books on analog computing, with the exception of books that are pre-1960, that are in languages other than English or German, or that have some other special interest. 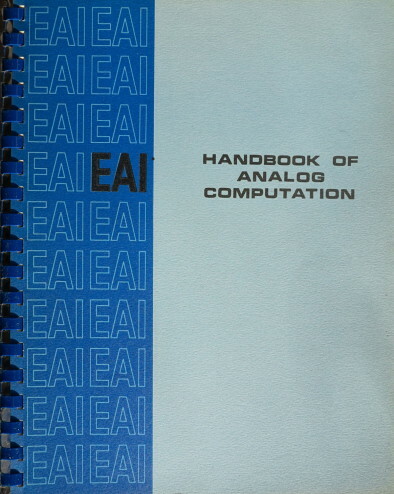 One of these ‘special interest’ exceptions is the 1967 edition of the ‘Analog Computing Handbook’ published by EAI, a company that was for a long time the main manufacturer of commercially available analog computers. The exact same edition can be found online (for instance here, for some reason wrongly labeled as the may 1971 edition), but recently I was very happy to find a yellowed paper version with smells that fit the epoch. This book is different from most other books on analog computation that I own, in that it is written as a practical guide for the people that actually operated these machines. It has less theory than most other books, and it is full of tricks that are now difficult to learn anywhere else since this is a kind of hands-on knowledge that has all but disappeared. This is really a minor variant on the recommended procedure, rather than a genuine alternative. In this approach, a computer variable is regarded not as a voltage, but as a dimensionless variable (a “pure” number) between -1.0000 and +1.0000. A variable with a maximum value of 5 feet would be represented on the computer by the “dimensionless” or “normalized” variable [x/5]. With this approach, the scaled equations and scaled computer diagrams will be the same as those produced by measuring voltage in units instead of volts. In other words, the difference between this “alternative” and the recommended procedure is purely psychological. Nevertheless, the difference can be important, since it goes to the heart of a person’s basic attitude toward an analog computer. If one thinks of the analog as an electrical model, or simulator of a physical system, then it is desirable to think of computer variables as voltages. It turns out that scaling is simplified if we use somewhat unconventional units (dekavolts, hectavolts), but the voltages lose none of their physical or electrical significance. If, on the other hand, one regards the machine as a computer, receiving numerical information (in the form of pot-settings, for example), and producing numerical or graphical output, then this “alternative” approach becomes applicable. Note that this is very similar to the way one thinks of a “number” in a digital computer — the digital programmer generally regards a piece of data either as a “pure number” or as a bit-pattern, but he rarely, if ever, concerns himself with the physical “meaning” of these bits — i.e. in terms of whether or not certain transistors are conducting, or whether a given core is magnetized. Both approaches are legitimate, and since it makes no practical difference in scaling, the programmer may adopt either position. This is the most precise formulation I have found anywhere of the exact reason why I find analog computing interesting: in analog computing, the relation between the computing that is going on and the materiality of the computer is very different than in current digital computers. This paragraph beautifully captures the change in perspective that is possible between a more ‘embodied’ view on computation and a more platonic one. In my view, this choice of perspective has immediate consequences for a whole lot of other presuppositions that seem to ‘naturally’ occur around questions of computation, information and simulation, but that I think are more related to choosing the more disembodied view of computing. I found it great to find these reflections precisely in the book that is the most aimed at the hands-on computer operators.